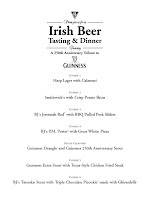 Click on the image to the right to see the full menu with beer pairings for each course. The cost is $30 per person which is a reasonable amount compared to other beer dinners that have have occurred lately. I've been to several different BJ's locations and I've always enjoyed their beer and and the food. However, their locations are typically out in the suburbs and are usually filled with young families and its not uncommon to have a long wait. A quick glance around the restaurant and you'll also notice that the majority of customers are not drinking beer (at least when I've been to them). They seem to be marketing themselves as a casual family restaurant that also happens to have house beers and not as a "brewpub restaurant". That's not necessarily a bad thing, I just wish Houston had a few actual, real brewpubs.